Our 24 hour pet hospital is located in Skokie and serves Lincolnwood, Evanston, Wilmette, Park Ridge, Des Plaines and Chicago. When you have a pet emergency, seconds count. We want you to know, we’re ready. 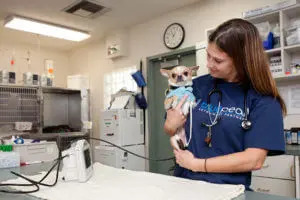 At BluePearl Skokie, our experienced team of veterinarians, vet technicians and support staff work closely together to provide the comprehensive, compassionate care your pet needs and deserves. Emergency: If possible, call ahead and let us know you’re coming. No appointment is necessary for our 24 hour emergency vet. Learn more about your emergency visit. Specialty Care: Our Skokie hospital is an emergency hospital. But we work closely with veterinarians at our Northfield hospital who are board-certified in critical care, internal medicine and surgery. To learn more about these services click here. We are an emergency pet hospital offering treatment for serious injuries and illnesses, as well as urgent care services. 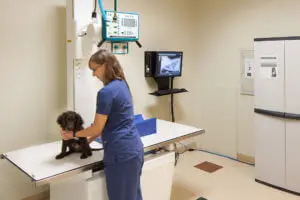 We have highly trained staff who use diagnostic methods such as ultrasound and X-rays for your pet. As a 24/7 emergency vet service, we are fully equipped to handle your pet’s needs.